Onsite inspection of DPWH Secretary Mark A. Villar (wearing white polo shirt) together with Regional Director Edgar B. Tabacon (wearing blue polo shirt) , District Engineer David p. Adongay Jr. , Assistant District Engineer Alfredo L. Bollido and Congressman Rogelio J. Espina (wearing red polo shirt). 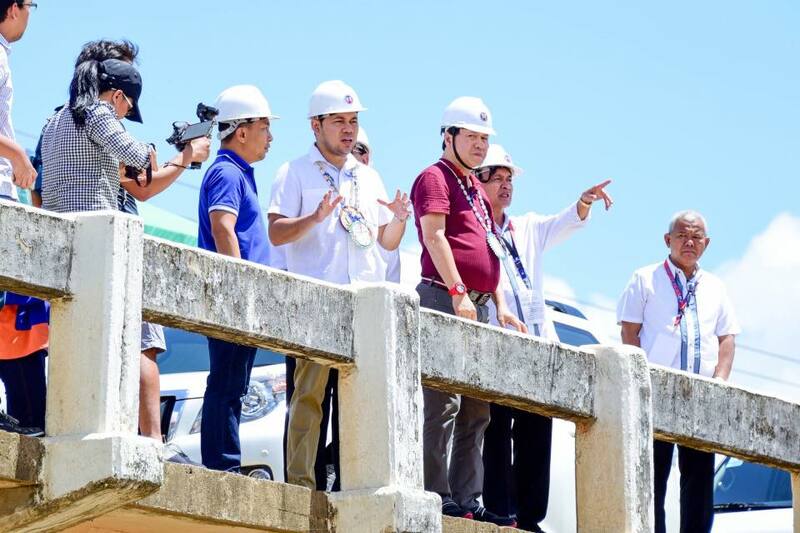 NAVAL, Biliran (DPWH-BDEO) – A higher, longer and stronger bridge that can withstand typhoons is planned for the construction of new Caraycaray Bridge according to Secretary Mark A. Villar of the Department of Public Works and Highways (DPWH). Villar visited the province on Wednesday, March 14 as one of the keynote speaker during the 23rd Biliran Women’s Congress in behalf of his mother Senator Cynthia A Villar. The DPWH Secretary also inspected the Caraycaray Bridge together with DPWH-8 Regional Director Edgar B. Tabacon, District Engineer David P. Adongay Jr., Assistant District Engineer Alfredo L. Bollido and Congressman Rogelio J. Espina to personally assess the structural damages of the said bridge. CarayCaray Bridge is one of the severely damaged infrastructures during the onslaught of Tropical Storm Urduja on December 15, 2017, thus total replacement of the bridge was recommended. ”Ginagawa na po yung plano, this year sisimulan na yung bagong bridge. On-going na yung planning stage, malapit nang matapos, 2 months nalang matatapos na yung final planning for replacement,” said Villar. The said bridge was opened to light vehicles on January 11, 2018, four days before the deadline set by the President. Heavy vehicles were advised to take the alternate long route Naval-Almeria-Kawayan-Culaba-Caibiran-Cabucgayan road and vice versa. Villar said that DPWH is also going to construct a detour across the Caraycaray River for heavy vehicles. This means that it would reduce their travel time from two and a half hour to just 30 minutes from Biliran to Naval, the capital town of the province. “Asahan niyo po gagawin namin ang lahat ng aming makakaya para mapabilis po ang construction dito sa Biliran kaya nandito po ako ngayon para siguraduhin na tuloy-tuloy ang construction at kailangan mabilis po ang construction dito,” he said. The Caray-Caray Bridge is an essential bridge because it is the only shorter access in going in and out to Mainland of Leyte. MAY THE NEW CARAYCARAY BRIDGE BE PASSABLE VERY SOON. THANK YOU MY PRESIDENT, AND SEC VILLLAR. CONG ESPINA TUTUKAN NATIN!